Today we have for you a new Rogues Gallery issue, The Myrmidon. 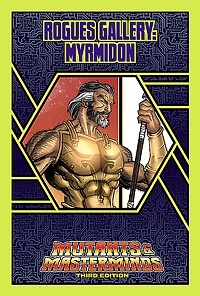 Possessing the same vaunted invulnerability as the Greek hero Achilles, the Myrmidon is an archaeologist from the early 20th century who, after gaining his powers, was locked away in another dimension. Now he’s been rescued by a powerful benefactor and has been forced to pledge his service to her cause … but that doesn’t mean he can’t use his abilities to recover rare and valuable artifacts for himself! Get the Myrmidon today—just $1.95! Ronin Round Table: GaymerX (GX3) Happy Holidays from Green Ronin!